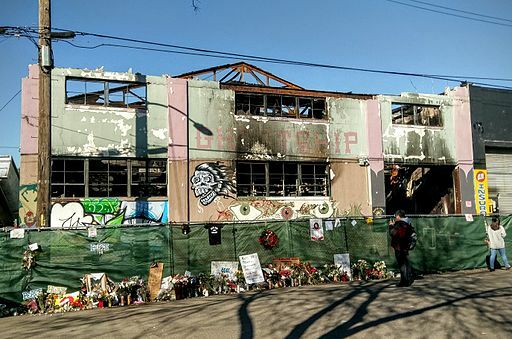 OAKLAND, Calif. (CN) – The master tenant of the Ghost Ship warehouse was arrested and charged with involuntary manslaughter Monday in connection with the deadly fire that killed three dozen concertgoers last December. Along with master tenant Derick Almena, Max Harris – who also lived at the Ghost Ship and sometimes collected rent for Almena – was also arrested and criminally charged Monday. Both men face 36 counts of felony involuntary manslaughter for allowing individuals to live in the Oakland warehouse, for doing electrical work on the building without permits, and for letting promoters throw music parties there without basic fire safety measures, such as lighted exit routes, in place. “Defendants Almena and Harris knowingly created a fire trap with inadequate means of escape, filled it with human beings, and are now facing the consequences of their deadly actions,” Alameda County District Attorney Nancy O’Malley said at a news conference announcing the charges Monday. Many have speculated that the warehouse’s owner Chor Ng would also be charged. Prosecutors declined to confirm this Monday, but hinted at a lack of evidence to substantiate additional charges. Drenick confirmed that the district attorney’s office has concluded its investigation into the fire. She also said the fire’s cause will remain undetermined, because it destroyed most of the evidence inside the warehouse. The Ghost Ship did not have the proper permits to be used as a residential space or an entertainment venue. Nonetheless, as many as 25 artists and musicians lived in RVs and improvised bedrooms on the building’s first floor, and 100 people attended the concert there the night it went up in flames. Multiple families of the fire’s victims have sued Almena, Ng and a slew of other individuals and businesses, claiming their negligence and failure to evict tenants from a space not zoned as a residence caused the deaths. Last month, the families added Pacific Gas & Electric to the growing list of 20 defendants, accusing the utility of failing to install separate electrical meters on the Ghost Ship and the buildings next to it as required by the state, and failing to monitor the dangerous flow of power to the buildings through the single meter that had been installed. According to the master complaint, the Ghost Ship’s power was supplied from an auto shop next door via a cable snaked through a hole in the wall, and extension cords and cables were strewn around the building. Almena’s lawyer, Tony Serra, issued a 10-page report in January suggesting that PG&E was to blame for installing inadequate wiring. Serra and the rest of Almena’s defense team said in a statement Monday that they “intend to vigorously defend” Almena in court. “We believe these charges represent no less than a miscarriage of justice, and we are confident that this attempt to make a scapegoat out of our client will fail,” they said. Almena was arrested in Lake County in Northern California, and Harris was arrested in Los Angeles County. They will be arraigned back in Alameda County, Drenick said. If convicted, Almena and Harris each face up to 39 years in prison.